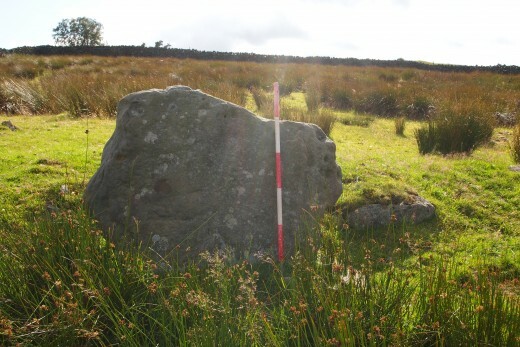 Among the earliest and most mysterious evidence for people living in Upper Nidderdale is the small number of cup and ring marked rocks found west of Gouthwaite Reservoir. These are thought to date from the Late Neolithic/Early Bronze Age, around 5,000 years ago. Similar ‘rock art’ is seen across the north of England with a large concentration on Rombalds Moor to the south. For more information, visit England’s Rock Art. Other signs of early settlement are the ‘lumps and bumps’ still visible in the landscape, including the Colt Plain Bronze Age settlement west of Gouthwaite Reservoir where there is evidence of hut circles, enclosures, pits, co-axial wall foundations and ancient track ways. There is a continuation of settlement in Upper Nidderdale into the Iron Age/Romano-British period, around 1,900 years ago. Settlement evidence at Ashfoldside Plantation includes hut circles, enclosures, and dry stone walled folds and pens. It is also likely that lead and iron mining began in Upper Nidderdale during the Roman period, evidence by the discovery of two Roman lead ingots (lead cast into shape for further working) in the Greenhow area in 1730s. Although the locations and general outlines of these settlements have been recorded for some time, little detail is known about them. In a similar way, later mining activity has removed evidence for these earlier mines.